I would like to see the UK be truly progressive and modernise the old, antiquated, early 20th century five day working week to a genuine 32hr, four day week. Definitely not a 40hr, 4 day week! I would like business, large and small, government and society in general to think about the benefits of people spending more time doing the things they love: spending more time with family, enjoying a little more leisure time. Not just working their lives away. The 5 day week suited the industrial revolution, perhaps it was even essential. And yes it has probably helped the economic growth seen in the West over the last 100years. But growth can't be endless. Constant consuming isn't sustainable. Why not slow things down a bit? Surely in this new age of technology a 5 day week just seems quite, well, last century. 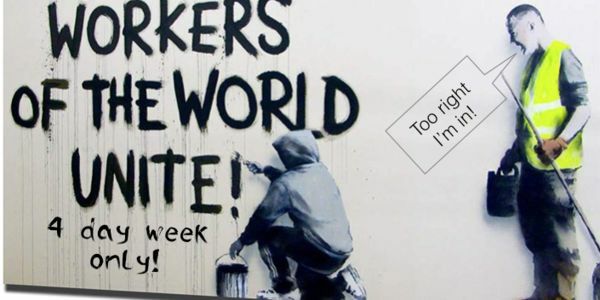 I would like the UK government to legislate that the workers of this country should not have to work more than 4 days in a single week and that they should not have to work more than an eight hour day. Thank You. Week 1. And it's amazing we already have 4 (Strike) 7 signings for our campaign to change the whole planets attitude to working time directives! ...and too celebrate this achievement we've updated our campaign with a brand new image. Relax, take it easy, work a 4 day week. You deserve it.